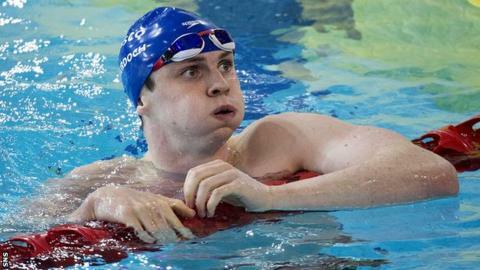 Commonwealth Games gold medallist Ross Murdoch has pulled out of this week's World Short Course Championships in Doha because of a chest infection. The 20-year-old breaststroke specialist could also miss the Scottish Championships later this month. Murdoch's exit leaves Hannah Miley, who also won gold at Glasgow 2014, as the only Scot in the Great Britain team. British Swimming has named an 11-strong team, with eight English and two Welsh competitors also taking part in Qatar. They boast 11 Commonwealth and seven European titles between them. "We will use it as a stepping stone to next year's Long Course World Championships." Head coach Bill Furniss has challenged the team to use the event as preparation for next year's long-course season, which culminates in the World Championships in Kazan, Russia. "We've had a good year with some strong performances and I'm looking forward to finishing it off at these Short Course World Championships," he said. "It isn't a benchmark event for us, but I think any opportunity to race against the best in the world shouldn't be wasted. "We will use it as a stepping stone to next year's Long Course World Championships and will specifically look at our starts, turns and finishes to see where improvements can be made. "All athletes will be in different stages of preparation. There will also be a number of short-course specialist swimmers, while others, such as the British contingent, will go into the event off the back of a hard block of training and preparation for next year." The championships, at the Hamad Aquatic Centre, last for five days from Wednesday. Men: Adam Barrett (Loughborough), James Guy (Millfield), Adam Peaty (City of Derby), Ben Proud (Plymouth Leander), Chris Walker-Hebborn (Bath). Women: Jazz Carlin (Swansea), Georgia Davies (Loughborough), Fran Halsall (Loughborough), Hannah Miley (Garioch), Siobhan Marie O'Connor (Bath), Sophie Taylor (London).